Published on January 10, 2014 in Cuba, Iran and Mauritania by unwatch. Closed Tags: Mauritania. 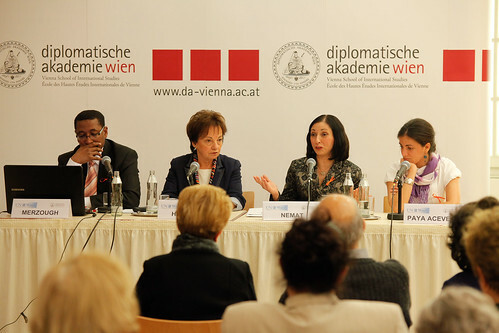 UN Watch’s Vienna Diplomatic Academy human rights conference featuring dissidents Abidine Merzough of Mauritania (far left), Marina Nemat of Iran (second from right), and Rosa Maria Paya of Cuba (far right). Moderated by Marta Halpert (second from left). VIENNA, November 26, 2013 – Iranian human rights activist and author Marina Nemat has little confidence in the new president Hassan Rouhani, who she fears the West considers to be moderate and conciliatory, especially after the recent agreement in the nuclear dispute. “The Iranian leadership is trying to show a moderate face,” Nemat said Monday night at a human rights panel organized by Geneva-based human rights group UN Watch. The panel, “Three dissidents, three states,” took place during the UN’s annual International Day for the Elimination of Violence Against Women.